This weapon is replica of the 22nd Century Colonial Marines in James Cameron's iconic and Oscar winning big screen movie 'Aliens'. 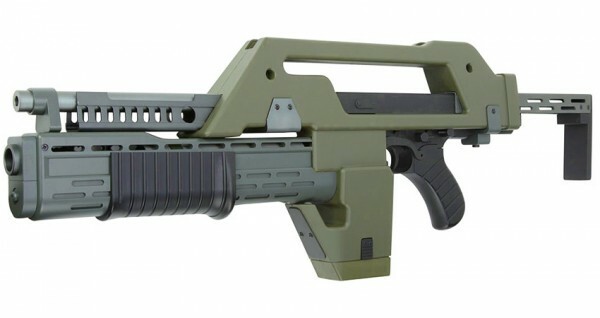 The replica of a fiction M41A Pulse Rifle that is a standard issue of the Colonial Marines and simultaneously being and of the iconic weapons of the science-fiction genre – of course next to the Han Solo’s blaster and the Space Marines’ bolter. The original of this rifle was shows in the movie “Aliens” in 1986 which was the second part of the saga about Ellen Ripley’s struggles with the aliens living cavernous depths of space. Momentarily the weapon dominated the imagination of every science fiction fan loving the military sector and weapon branch. The M41A Pulse Rifle replica was built on the base of a combat-proven SW-05 model made by the Snow Wolf company. This allowed easy access to the replica for every “Aliens” series fan or anyone loving science-fiction in general. So far, the construction of the M41A required enormous funds – you needed to buy a M1A1 replica and then you had to mount the very expensive conversion all by yourself. Now, thanks to introducing the new ready product to the market, it is possible to achieve an even better effect with a smaller amount of money. The replica was made of a homogenous zinc and aluminum alloy and of a durable polymer plastic. Thanks to the foldable stock and cylindrical shape, the operation of the replica is rather comfortable ( taking into consideration the enormous size of the replica ). The replica is equipped with a functional firing counter, counting down from 95 to 0. It is vital to zero the counter while the count begins again only after taking out the old magazine and replacing is with a new one. The replica is fed with standard short SW-05 magazines that hold 190 BB pellets. You need to remember that other magazines do not fit the SW-05 replica. 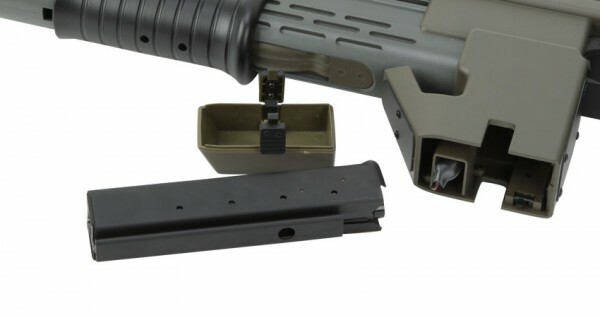 The magazines are loaded with the use of internal cartridges – in order to change the magazine it is necessary to open the lower flap securing the magazine’s well. The replica has a 270mm long inner barrel and a pneumatic mechanism giving the muzzle velocity of about 360 FPS. The replica is powered with a stick type battery that is located in the grenade launcher dummy that is in the front under the barrel. 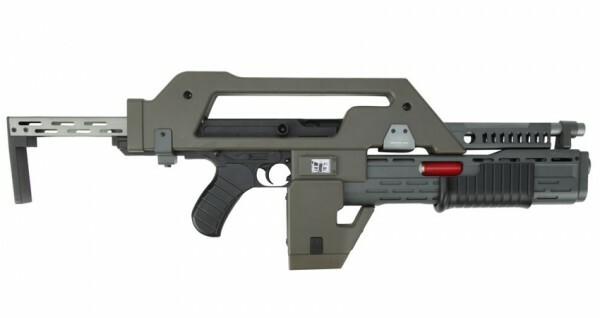 This surely isn’t a typical replica for weekend games, yet bearing in mind its symbolic, uniqueness and pure fun that the shooting the replica gives on airsoft events it will surely find recognition in the eyes of many science-fiction fans. 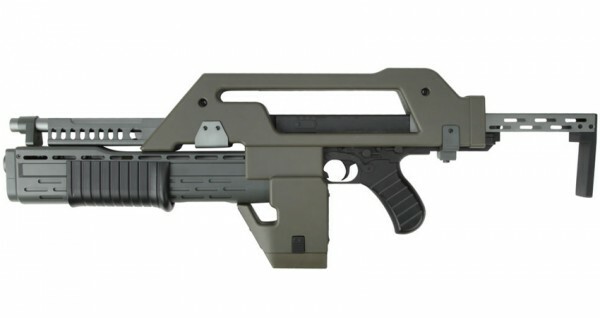 Powered by a stick battery housed under the fake grenade launcher with a 9v PP3 powering the counter, the gun is supplied with a 190 round Thompson hi-cap. 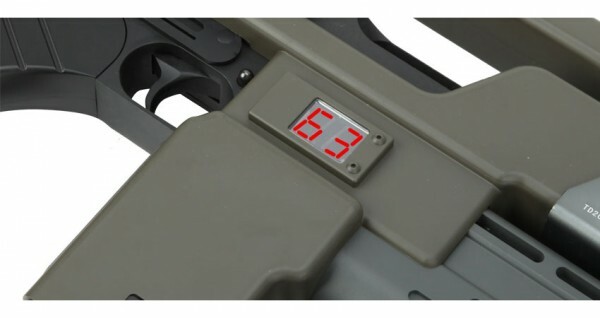 It will accept the longer 420 round mags but you cannot fit the base plate if you go that route. This kit for all Alien's and Sci Fi fans! Bought this rifle as I have been an aliens fan for years and always wanted a pulse rifle. Yes I could have bought the kit but to be honest I didn't have the time to build it. First impressions are that the battery compartment is very tight, the battery fits but only just and I mean just. Weight is considerable but that's the point with this weapon. The mag is a pain in the behind to feed in, once you lock it in its fine but changing mags cannot be done quickly. I've never liked high cap mags but this one works well. I will try other mid caps to see if they fit despite the description above. In all only buy this if you are a die hard fan, not really for use in skirmishes (well not for a full day anyway). Impressed, kind of as I like the pulse rifle but the battery compartment and hard to insert mag does weigh heavily. Knowing this would I have bought the rifle anyway, probably as I've wanted it for ages, but then again, time will tell if this is a worthy purchase.